Ever since I first conceived of the Rock Prodigy Training Center, I’ve been pondering a cheap and simple mounting system that would allow for instantaneous spacing adjustments. Once the RPTC was unveiled I got a number of great ideas from other climbers. 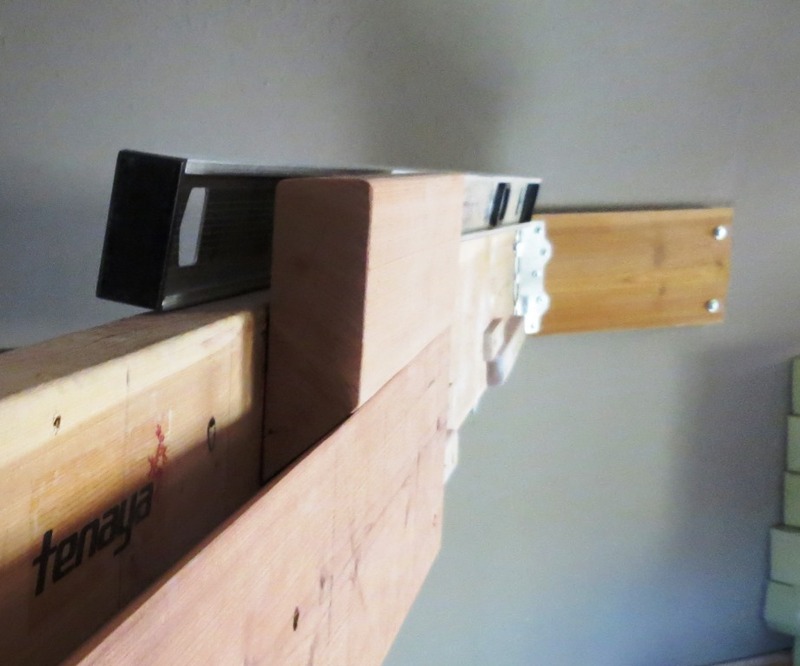 Julian Marks suggested a “French Cleat” system in this Mountain Project thread, which uses two pieces of angled lumber to create an integrated hook on the mounting structure that slides along a fixed receptacle. 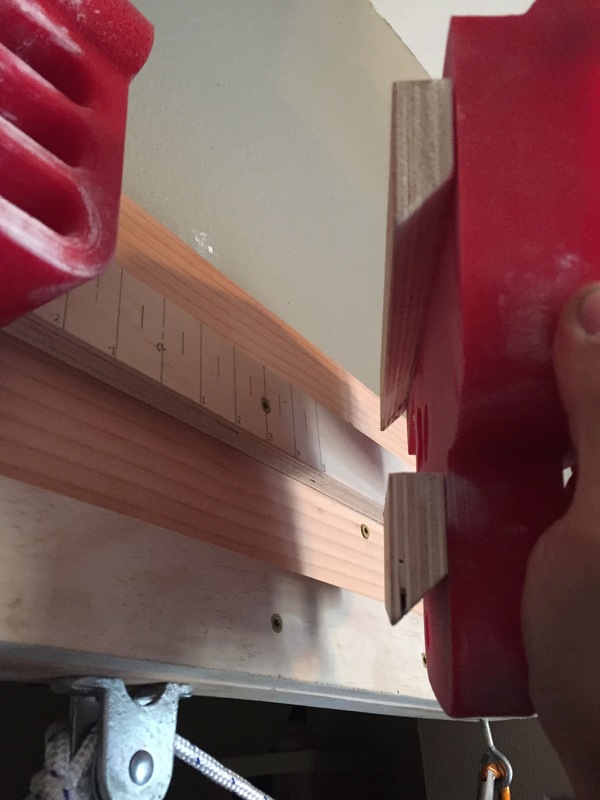 The French Cleat concept: The upper incut board (fastened to a piece of plywood and one half of the RPTC) hooks onto the lower, fixed incut board. This allows the upper unit to “float” freely from side to side along the fixed cleat. Below are step-by-step instructions for building the mount shown. If you have any suggestions for streamlining the fabrication process, please share them in a comment! I started with an 8-foot long 2×8, because I wasn’t sure how “tall’ the cleats would need to be. I went with 5.5” for the long fixed cleat and 5” for the two floating cleats (so a 2×6 would have worked for either cleat, though in retrospect, 5” for both cleats would have worked too). The first step, and by far the crux of the project, is to make an angled rip cut in the 2x piece of lumber. The cut needs to be as precise as possible, since the surface created by the cut will be the mounting surface between the two cleats. Irregularities in this surface will cause the cleats to “wobble”. For the fixed cleat you need to make a rip cut ~3.5-feet long, and for the two floating cleats you need to make a rip cut ~2.5-feet long. If you are using the same cleat height for the fixed and floating cleats, you can make one 6’-long rip cut (or if you’re using a 2×10, one 3.5′ rip cut would probably do it). 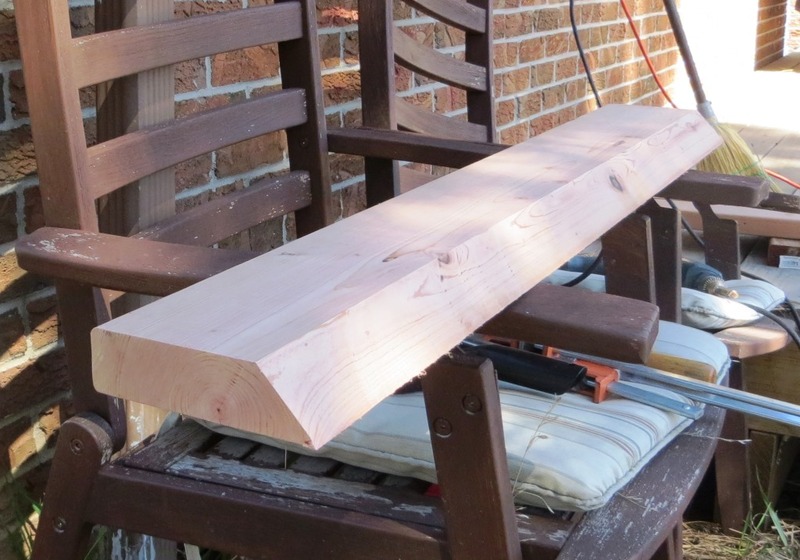 Make the cut at least 6” longer than you need because you will want to trim the a few inches off each end of the finished board. Dimensions of the piece parts. I found making the rip cut to be quite difficult, and I failed on my first attempt. A table saw or better would be really nice to have for this cut, but I was able to do it (eventually) with my circular saw. My initial error was using a “speed blade” on my circular saw, which is designed to be thin so that less material is removed while cutting, thus allowing for speedy cuts. Each time the thin blade crossed the wood grain it would flex slightly, causing the cut to veer off course. Once I switched to a thicker blade I was able to make the cut, though it was still difficult. 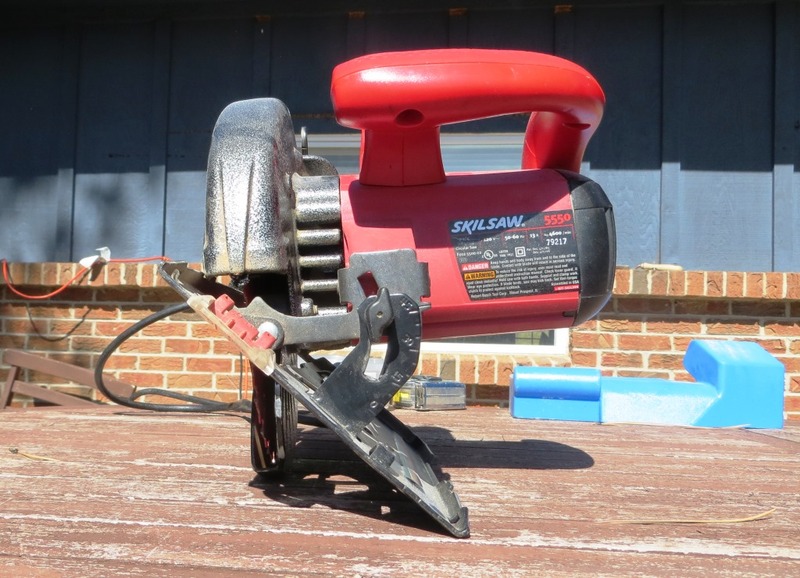 My circular saw, setup to cut at a 45-degree angle. The blade in this picture is the Diablo speed blade. 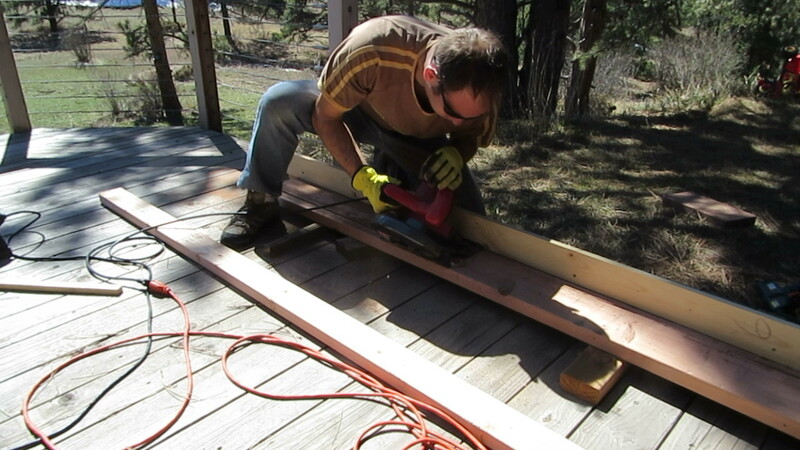 Building a guide (aka “fence”) out of a 2×4 and 1×4 to keep the circular saw aligned correctly during the rip cut. 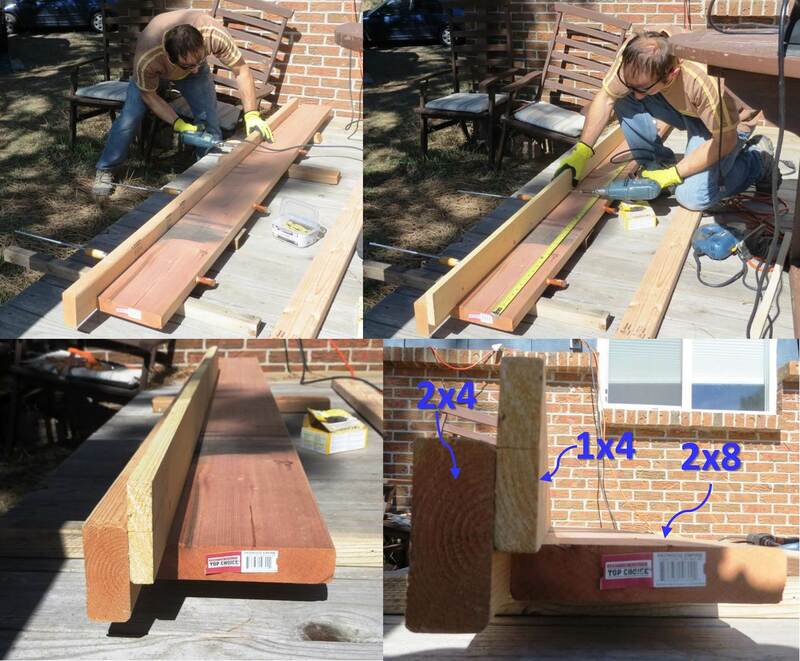 The 2×4 is fastened into the 2×8, and the 1×4 is fastened to the 2×4. Once the cut is complete, the 2×4 and 1×4 are removed. A few tips on the rip cut: 1) when starting, cut about 2” into the board, then back out the saw and go back in again. Repeat as necessary to ensure the saw’s guide plate is lying flat against the board and flush against the 1×4 (or 2×4) guide rail. 2) The entire time you are cutting, apply firm pressure down, and into the guide rail to prevent the saw from lifting up or veering off course. 3) Take your time! This is not an easy cut to make. Making the angled Rip Cut. Once the rip cut was made I used an electric sander to smooth down all the new edges and the angled surface. This surface will be the mating interface between the cleats so you want it to be as smooth and uniform as possible. Next I cut the fixed cleat down to size. This cleat is 5.5” tall, and I decided to make it 34.5” long. It could be longer, but this is all I had space for, and much longer than I need. This allows me to vary the spacing of my RPTC halves from 0” to 9.5”. The cut fixed cleat (before sanding). To make the two floating cleats I flipped the 2×8 around, and installed the 2×4 guide fence on the opposite edge of the 2×8, but left the 1×4 off, to create a 5” tall cleat. [Note: This isn’t ideal; I had to do this because I messed up the first rip cut and so half of my 2×8 was essentially ruined. By shortening the height of the cleat by 0.5” I was able to salvage this half of the 2×8. If I were doing it again I would make one rip cut, ~6-feet long, resulting in a cut 5.5” from the edge of the 2×6/8, and I would use that piece to make the fixed cleat and the two floating cleats.] I cut this piece into two 12.5” long pieces (about ¼” longer than one half of the RPTC). Making these longer would probably increase the stability of the finished assembly, but it would require more mounting space as well. The 12.5″ length has worked fine for me, but I notice a bit of flex when I’m using the pinch grips. A finished floating cleat perched above the fixed cleat. Next I cut out two 12.5” by 10” rectangles of ¾” plywood. These pieces will be attached to the floating cleats, and then the RPTC halves will be mounted to the plywood. With all the pieces cut to size, it was time to assemble the contraption. 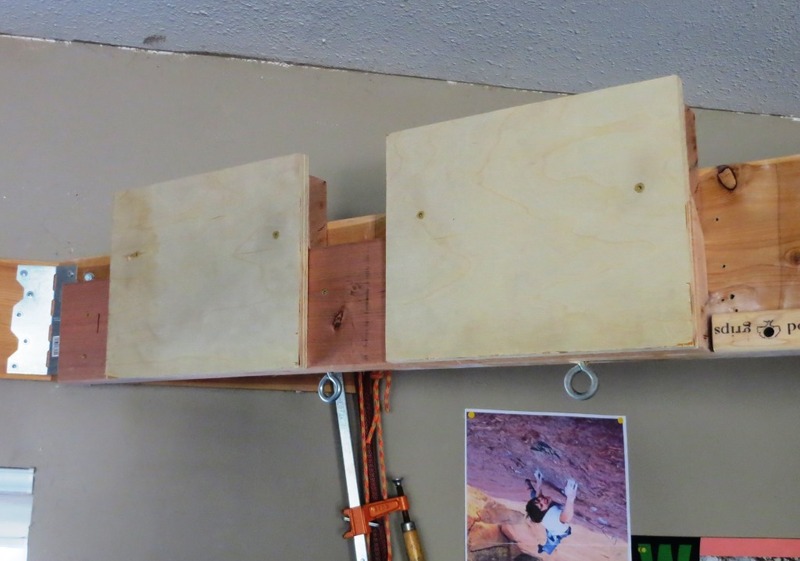 Make two rectangles of ¾” plywood, measuring 12.5” wide by 10” tall. The first step of assembly is to mount the fixed cleat to your mounting structure. Use a level to get this cleat lined up properly. In my case, I was mounting to a long 2×8, so I used a handful of 3” long wood screws to fasten the fixed cleat. If you are mounting to a wall with hidden studs, or some other structure, longer wood screws, lag screws, or bolts may be required. If using wood screws, use at least six, but make sure the fixed cleat is firmly attached to the mounting structure. Next I placed the floating cleats onto the fixed cleats, and lined them up in the locations I expected to use them the most. I then attached the first plywood rectangle to the first cleat using two 2” wood screws (longer screws will penetrate the mounting surface and defeat the purpose of this entire enterprise). I lined up the rectangle so the lower horizontal edge was flush with the lower horizontal edge of the fixed cleat (this meant the top of the rectangle protrudes about 3/4” from the top of the floating cleat). Once I had the first screw in place, I used a level to get the lower edge of the rectangle level. Install the second rectangle in the same way. It helps to have a clamp for this step. 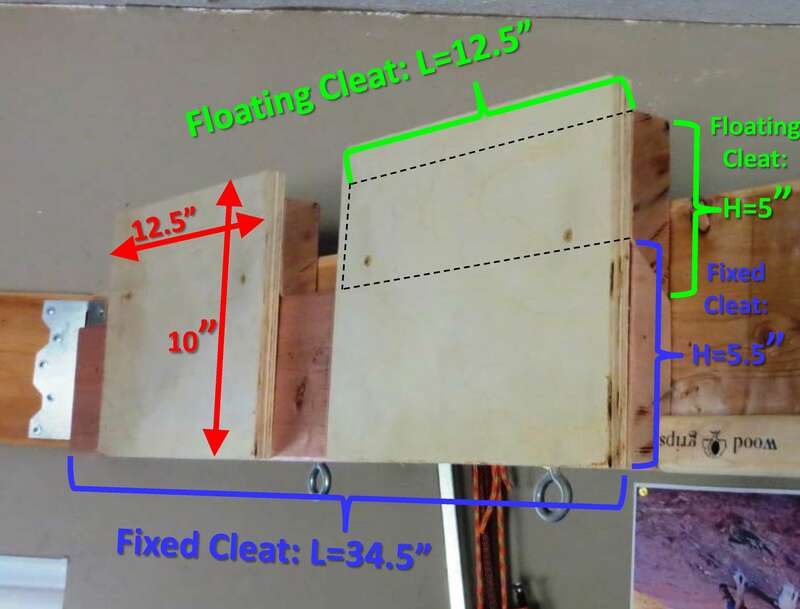 The two plywood rectangles attached to the floating cleats. Use two 2” screws for each plywood piece. More screws will be added later. Use the screw lengths specified here when attaching the RPTC halves to the floating mounts. Once all the screws are installed, test your installation. You should be ready to rock! I suggest attaching or scribing a ruler onto your fixed cleat to allow for quick and repeatable adjustment of your RPTC spacing. Note the spacing used for each grip position in your Hangboard Log Sheet for future reference. I’ve been training on this mount for the past two weeks now, and I’m really happy with it. I’m looking into ways to streamline the construction of this type of mount, so if you have ny ideas, please let me know! UPDATE November 2014: Mike designed another method for an Adjustable Mount for the RPTC. You can read all about it, with pics, here. Mark, I’ve done French Cleats before though not for a hangboard. Using a table saw is MUCH easier. Your system seems to have worked very well for use with a circular saw. I prefer using a thicker saw blade to keep cuts accurate, though pick a blade with a higher tooth count to keep the cuts smooth. That may keep your saw from bogging down as long as it has enough power. Hope that helps some. Question: Could this also be used to switch out different hangboards and tools for training? Thats what I figured but I just wanted to know. I am moving very soon into a very urban area and will still be considerable distance from a gym and so I am playing with the idea of getting a Blank Slate for our apartment and this could vastly improve that tool as well. Thanks! doh! i just spent the weekend building the FC system (actually a pair of them side by side – one for me, one for my wife). 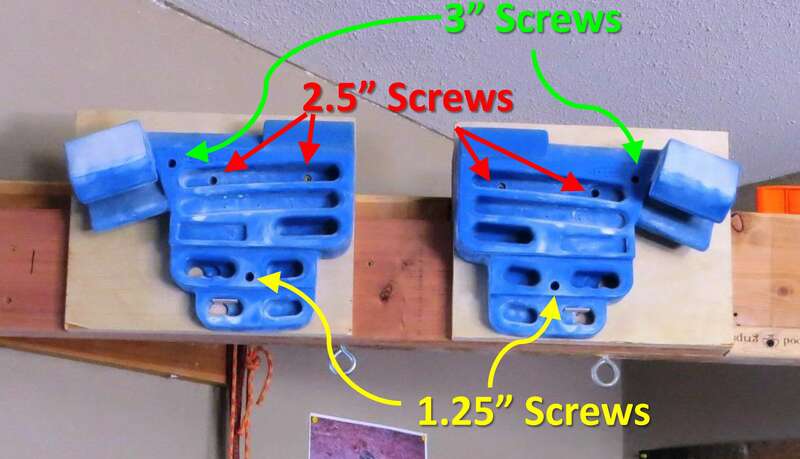 one quick question for mark – the bottom screw that mounts the hangboard, should that be more like a 1-1/2 or 1-5/8? i tried the 1-1/4 but it didn’t really bite in, so i went with 1-5/8. i did my first HB workout last night with this system, and so far i really, really like it. i built this one outside, under our deck in the back yard. i will probably build another one in the garage for the colder months. maybe i will try rockprodigy’s new design for the garage version. I took pretty good notes while building so I’m pretty sure I used a 1.25″ screw, but maybe I over-drove that screw during the original mounting, thus creating a deeper countersink. Mike, I have spent the last two days scouring your site while anxiously awaiting the two books i ordered. 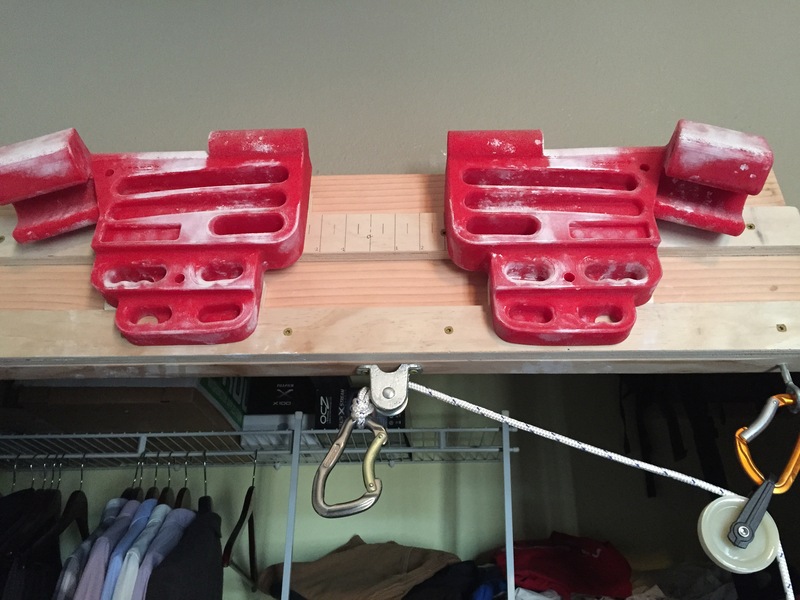 (one for me and one for my climbing partner) I am getting ready to build the adjustable hang board setup as shown here but wanted to know if you got around to jotting down the info for lower profile and lighter version. Thanks for the great work and motivating info. I was one of those climbers that lived and breathed climbing for years, subsequently 5.12b just came as a result of climbing 4 days a week. Now that i just turned 39 my ultimate goal of “climbing 5.13 (twilight of a champion or the gift, both in Red Rock, were always drool favorites) by the time I’m 30yo” never looked so far away, but this website and your book have me drooling all over again. I am looking forward to sending big soon. JT I’m 58 and have never trained for climbing before, so my best effort years ago was getting up Los Hermanos in Indian Creek, bitd it was 12a or 11d. Anyway I look at this program and the sky is the limit and plan to enjoy the process while trying to let go of a projected outcome, i.e.climbing a specific climb or at a specific grade level. I’m anxiously awaiting my RPTC in the mail but already making plans for a French cleat installation system. From the wording of the post, it sounds like the relative height of the fixed and floating cleat is somewhat arbitrary — but I’m wondering if anybody knows what the truly optimal geometry is. To me, it seems like it would be best to have the fixed cleat relatively tall and the floating cleat short, such that the RPTC hangs mostly below the mating interface. Seems like the forces on the mounting system would then be mostly down, rather than down as well as out, particularly when using holds high on the RPTC. Is there a reason not to make the floating cleat shorter, say only 1-2″, with the fixed cleat say 8-9″ tall? Within the limit of maintaining the structural integrity of the floating cleat, it seems like the shorter the better, right? 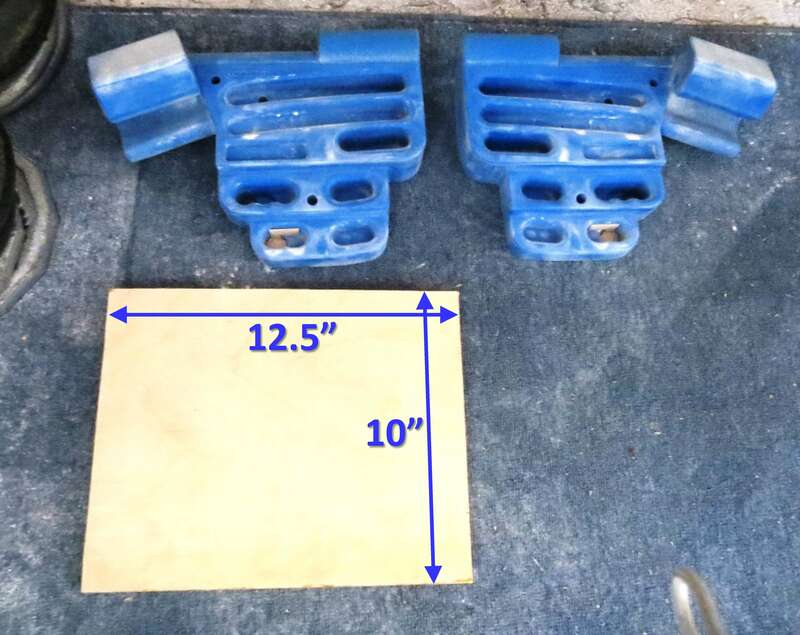 (To be perfectly clear, above I’m only asking about to the vertical dimension of the two cleats — although I also wonder whether going with a 14″-long floating cleat would help reduce some flex when using the pinches). I think you have the right idea–make the fixed cleat as “tall” as possible. If I were you, I would look at the pics I posted in Update #2 and do something similar. That is, a tall fixed cleat and a short floating cleat, both made of plywood. Thanks for the super quick reply! I definitely checked out Wes’s setup and worry only that I don’t have the carpentry skills to pull off the double cleat! My “design” skills far exceed my “execution” skills when it comes to woodwork! I wonder whether a single cleat, mounted fairly high as we discussed, using 3/4″ plywood would work well. Basically I’m envisioning a hybrid of your setup and Wes’s, using a single cleat but with plywood instead of 2x lumber — but worry that using 3/4″ plywood will not give a single cleat enough “bite” to not pop off unexpectedly. 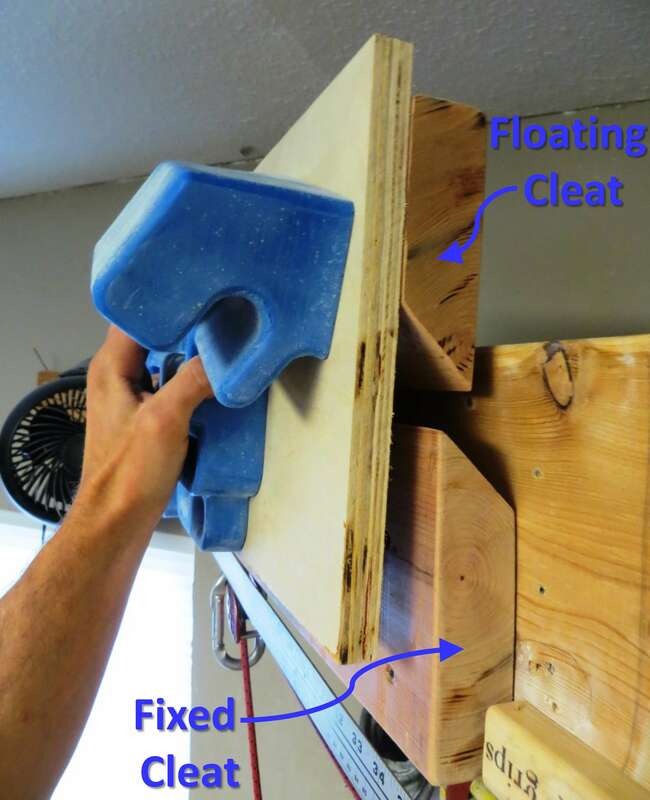 Perhaps I could screw a thin rail into the baseboard above the floating cleat once it is in place to keep it from coming up and out of the fixed cleat? With a few millimeters of clearance, the floating cleat could slide easily, but could not pop out because it would have a sort of “lid” blocking an significant vertical motion. Thanks for your help with this, and I can’t wait to start hangin’!!!! I really think it would work, but the only way to find out for sure is to try it. It would be pretty easy to add a safeguard after the fact if it turned out sketchy. I ended up going with 2x lumber, and I posted a little “trip report” of my installation on the MP.com thread linked at the top of the page. I’m stoked with the way it came out. Full details with measurements and pictures are included over there for anybody that’s interested. To attach the plywood backer board to the floating cleat, I used two 1 5/8″ dry wall screws, plus the 3 screws that mount the RPTC itself. Glue would be a great idea, but so far everything is holding very solidly without it. I’ve been pouring over my new “Rock Climber’s Training Manual” and have been setting some goals and designing my workouts. Stoke is high. And I really do have give a shout out to Tommy and Kevin over on the Dawn Wall who have been a true inspiration over the last couple of weeks. Seeing them battling it out has really moved and inspired me in ways that are hard to describe. I’ve found their determination and perseverance uplifting. Oh yeah, and their climbing isn’t too shabby either! These are the things we must keep in mind in the depths of winter during our own training sessions!!! Finally, thanks again Mark and the many others on the MP.com thread for the great input and suggestions for the RPTC installation.